Serenade in D Major, KV 239 "Serenata notturna"
Symphony No. 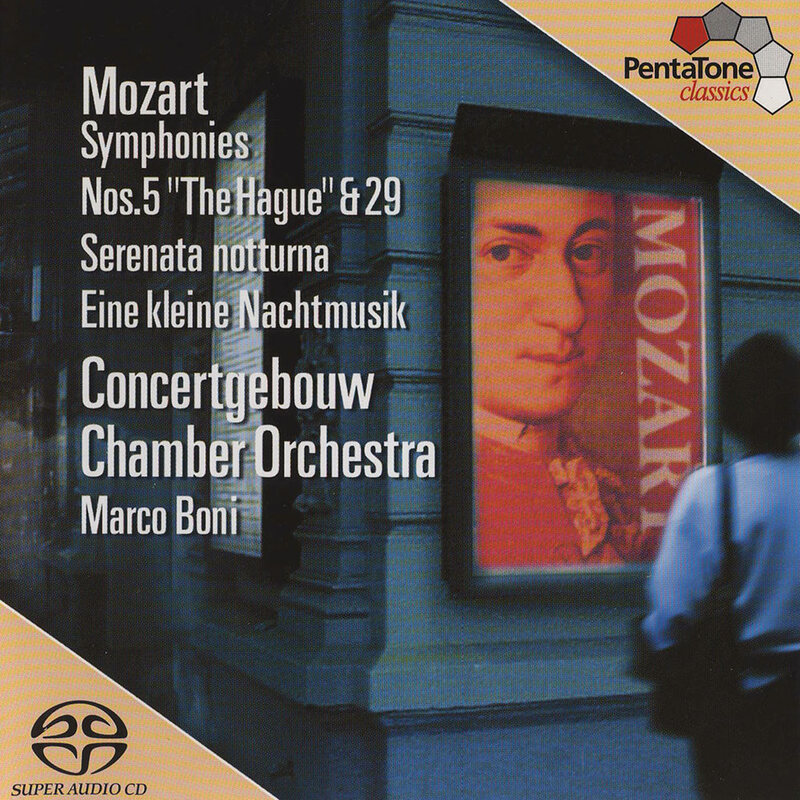 5 in B-Flat Major, KV 22 "The Hague"
Serenade in G Major, KV 525 "Eine kleine Nachtmusik"
"... (the Concertgebouw Chamber Orchestra) never before have sounded as good as they do here. The string tone is full, rich and defined ... Boni leads spirited performances ..."
"... high quality period-style performances, marked by predictably brisk tempos, taut rhythm, no vibrato in the upper strings and attention to repeats." "Four Stars ... a juicy blend of scholarship and lush musicianship in this audiophile’s album, which gives us Mozart at different stages of his amazing career. Eine kleine Nachtmusik chugs and purrs with the verve and high spirits we expect: cheery, buoyant, immaculately balanced." Marco Boni conducts the Royal Concertgebouw Chamber Orchestra in a period performance of these orchestral works by Mozart. The album includes Symphony No. 5 "The Hague" and the popular Symphony No. 29 separated by the two Serenades. Microphone pre-amps: Custom built by Polyhymnia International BV. Outputs directly connected to Meitner DSD AD converter.